Tammam Azzam's collage paintings, an extension from his recent Paper series, are currently being exhibited as a solo-presentation at Galerie Kornfeld in Berlin, Germany, the artist’s city of residency. This marks the first time the Syrian artist's work is displayed at the gallery. The exhibition will be accompanied by a catalogue featuring essays by art critic Ralf Hanselle and curator Heinz Stahlhut. Azzam's mosaic like collage work incorporates up to 50.000 shreds of hand painted paper, creating fragmented scenes based on photos of destroyed architectures and cities. 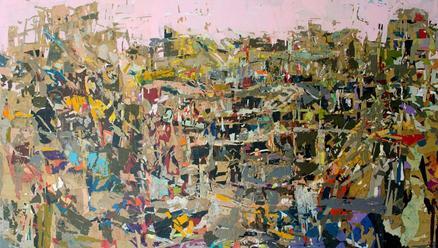 As Swiss curator Heinz Stahlhut accurately puts it, “the layering of his collages realistically reproduces the broken surfaces of the bombed-out architecture, but at the same time, however, they are indicative of a most sensitive style of painting.” The pieces featured, demonstrate the artist's acute mastering of abstraction and his particular focus on the constructive nature of the synthesis. The solo exhibition will run from 14 August - 20 October 2018.